Historical Marker #18 in Robertson County commemorates the Battle of Blue Licks, which is sometimes called the last battle of the Revolutionary War. In August 1782, a combined British, Canadian, and Native American force made a foray from southern Ohio into Kentucky against Bryan's Station (near present-day Lexington). Finding the fortification seemingly well defended, the command withdrew back north. 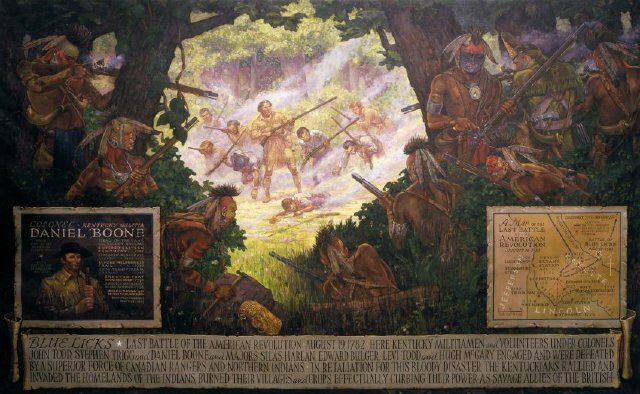 A group of Kentucky settlers from across the Bluegrass Region—including Daniel Boone—rallied against the threat and set out in pursuit. 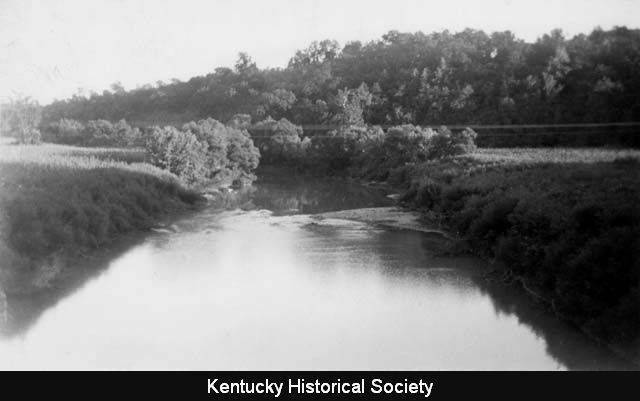 On August 19, the Kentuckians reached the Blue Licks crossing point of the Licking River. There, the pioneers observed some Indians run over a hill just out of gunshot range. Boone quickly advised the men to make a tactical flanking maneuver in order to avoid a potential ambush from nearby ravines, but the furious Kentuckians ignored Boone's advice and continued after the enemy. The impetuous attackers soon became the attacked. When the settlers came within easy range, the Canadians and Indians fired from the cover of the hiding places Boone had warned against. The volley of gunfire surprised the pioneer force and threw them into a panicked retreat. During their disorganized flight, the some of the settlers were caught by the Indians—mainly Wyandots—and were hacked down with tomahawks. 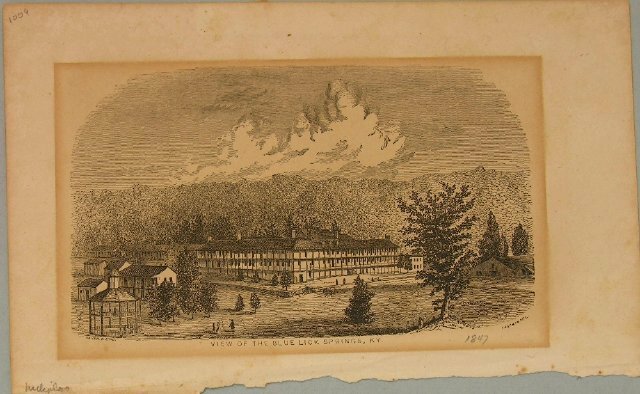 The fight was basically over before it began, but the engagement left about seventy of the Kentuckians dead, including their leader, Colonel John Todd, militia leader Stephen Trigg, and Boone's son, Israel. After a short pursuit, the Indians returned to the battlefield and mutilated the dead. A force under Benjamin Logan, which did not arrive in time for the fight, met the fleeing settlers and then arrived at the battlefield a few days later. Logan's men buried their fellow settlers. The Battle of Blue Licks came several months after Washington's defeat of Cornwallis at Yorktown, Virginia. Fortunately for the American cause, however, the frontier defeat was not enough to influence the outcome of the Revolutionary War. The Treaty of Paris, signed the following year, settled the conflict, but certainly not the fighting between settlers and Native Americans on the Kentucky frontier. 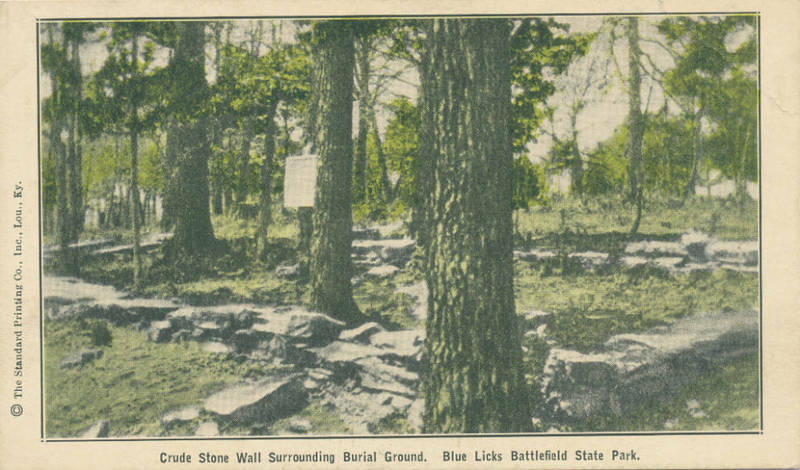 Today, the Blue Licks Battlefield is part of the Kentucky State Park system. A monument there remembers the pioneer men who died during the battle. Licking River: This photograph shows a crossing ford on the Licking River at Blue Licks. Courtesy of the Kentucky Historical Society. Pioneer Graves: A number of the men killed at the Battle of Blue Licks were buried on the field. Courtesy of the Kentucky Historical Society. 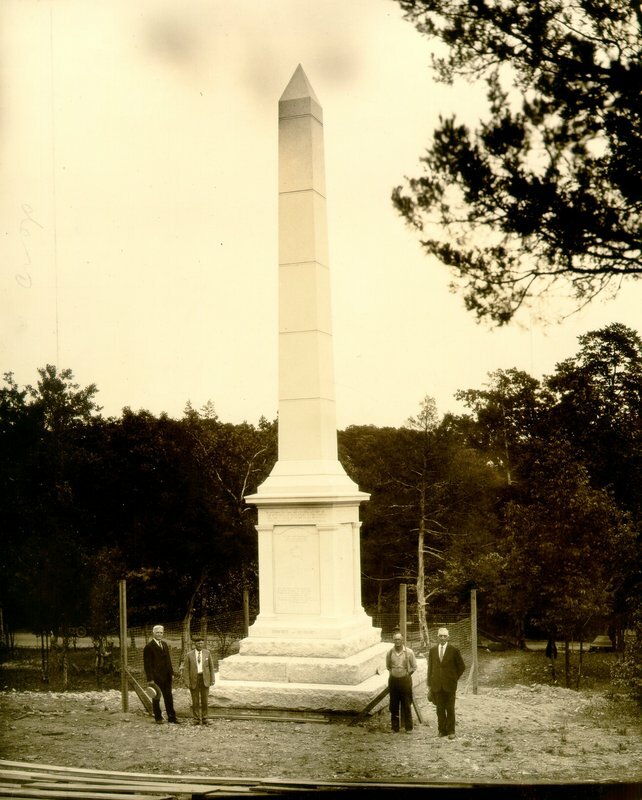 Blue Licks Monument: A monument was placed at the graves of those settlers that died at the Battle of Blue Licks. Courtesy of the University of Kentucky. The Battle of Blue Licks: This commemorative painting of the Battle of Blue Licks was made in 1938. Courtesy of the Kentucky Historical Society. 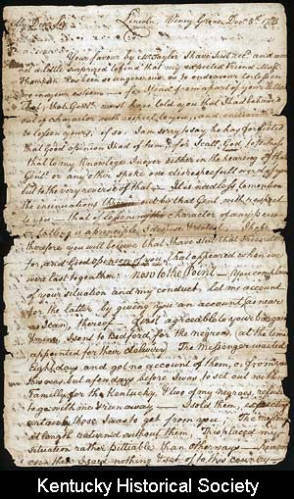 Stephen Trigg Letter: This letter was written by Stephen Trigg in 1781. Trigg was killed a year later at the Battle of Blue Licks. Courtesy of the Kentucky Historical Society. 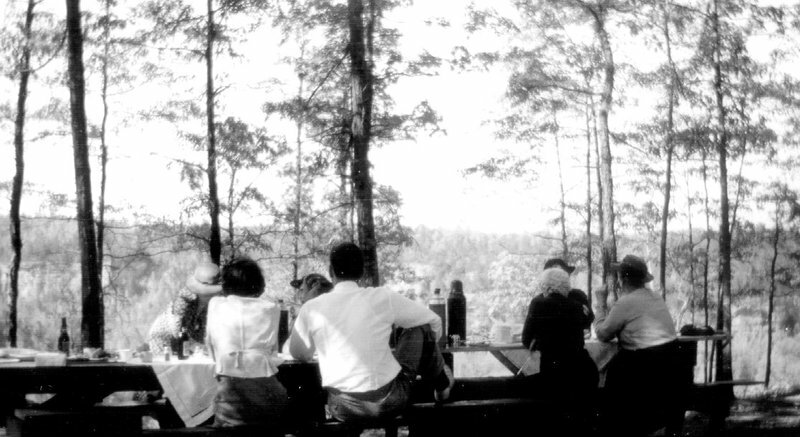 Blue Licks Resort: A mineral springs resort developed at Blue Licks in the nineteenth century. Blue Licks was also home to the Western Military Institute for a time. Courtesy of the Kentucky Historical Society. Blue Licks State Park: The Blue Licks Battlefield in Robertson County is now a Kentucky State Park. Courtesy of the University of Kentucky. 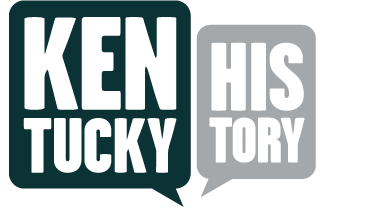 Tim Talbott, “Blue Licks Battlefield,” ExploreKYHistory, accessed April 19, 2019, https://explorekyhistory.ky.gov/items/show/590.